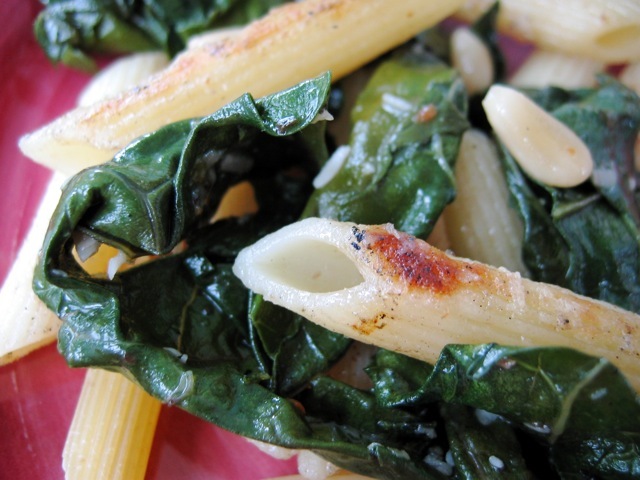 This dish, invented by my brother, Dave, is very simple — nothing more than penne pasta with Parmesan and chard. But it's not really easy. The exact amount of each ingredient isn't as important; you can vary them if you like. The trick seems to be in the timing during the sauté stage. It's also not a bad idea to halve this recipe, as it makes the stage in the sauté pan more manageable. If you don't feel you've got it right the first time, don't give up. It may take some practice. Boil the pasta in a large pot of salted water. Undercook it slightly, because it's going to get tossed into a sauté pan and cooked some more later. Drain the pasta and run it under cold water to stop the cooking. Sprinkle it with a little olive oil and mix it up to keep it from sticking together. Pour about three tablespoons of olive oil into a large skillet (about 14 inches across). Over medium heat, sauté the garlic for just a minute, then toss in the chard and sauté until the greens have wilted. Turn the heat to high and toss in the penne. If the full pound of pasta seems too much, just use as much as you can manage in the pan. If you're using the pine nuts, toss them in, too. Mix everything up, then let it cook for a minute or so. (The pasta will want to stick to the pan if you're not using a nonstick pan, and that's OK.) Add the Parmesan and mix again. Here's the tricky part, in which you alternate letting the pasta sit peacefully, browning away, with vigorously scraping the pasta up and turning it over with a flexible spatula. Do this two or three times, alternately ignoring the pasta for a minute at a time with enthusiastic scraping and flipping. You don't want the pasta on the burner too long, because you don't want to overcook it or burn it. But you do want to brown the pasta and cheese. The dish should have a little bit of crunchiness to it and the penne should be browned in places. Add salt to taste, but go carefully, as the Parmesan adds saltiness as well. Scrape the pan hard to get off all the pasta and browned cheese, then transfer to a bowl. Serve with a little additional grated Parmesan and a nice loaf of bread or a salad. Yes, the pan is a mess to clean up afterwards. Add soap and water while the pan is still hot and let it soak while you eat. Culinate editor's note: If you don't have a 14-inch skillet (most home cooks don't), use a wok instead.